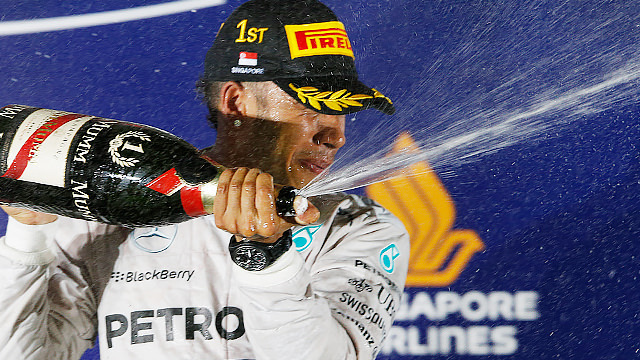 The Singapore Grand Prix was another pivotal point in the fight for the 2014 title, as Lewis Hamilton took the win and the lead in the championship standings by three points. The Brit started from pole position, but opted for a different strategy to all those around him, after a safety car brought out by Sergio Pérez shedding his front wing. Left to create as much of a gap as possible before a last ditch pit stop, Hamilton rejoined behind Sebastian Vettel but soon took the lead on fresh tyres and crossed the line in first place. And what of teammate Nico Rosberg? The German couldn’t get off the line for the formation lap after electrical trouble with the steering wheel. He started from the pit lane but problems continued to hound him until he eventually retired during his first pit stop. Afterwards Rosberg said: “The gear paddles sort of worked but they would always upshift two gears at a time. My brake balance was completely in the wrong place. Coming into the pit stop, I didn’t have a pit limiter, I couldn’t go into neutral, I couldn’t do anything.” He called it the toughest day of the year for him so far.